Photo: NYTHA President Joe Appelbaum (right edge of check) presents the $15,000 to Dr. Hallie Zwibel, D.O., Director of Sports Medicine for NYIT (left edge of check). Ramon Dominguez (second from right), John Velazquez and Javier Castellano (5th and 6th from right) also took part in the presentation. 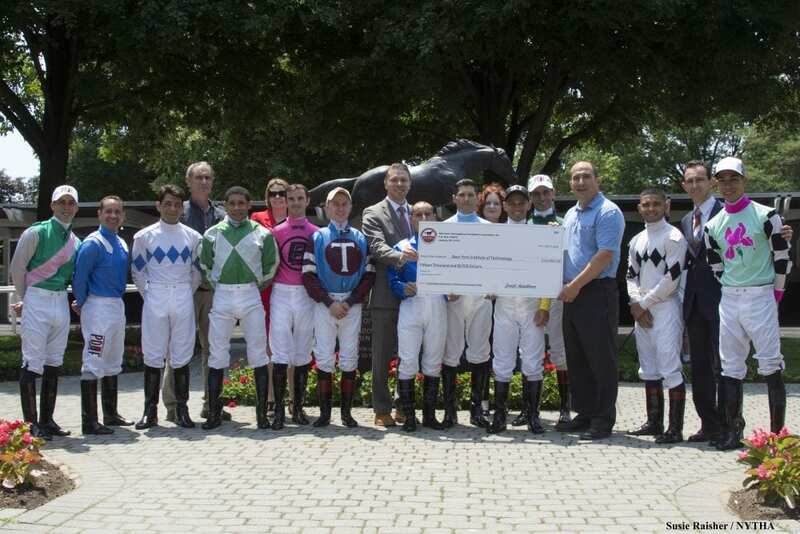 The New York Thoroughbred Horsemen's Association has donated $15,000 to fund a New York Institute of Technology study on concussion and helmet safety. “The Computational Assessment of Helmets and Concussion,” led by Dr. Milan Toma, will collect data on jockey head protection through simulation testing of various helmet designs. This data will be shared with other researchers studying head trauma in professional sports, with the goal of determining the best head protection under various racing conditions. Dr. Toma, Ph.D. is an assistant professor in the Department of Mechanical Engineering at NYIT School of Engineering and Computing Sciences. His areas of expertise include image processing, high-performance computing, computational mechanics/biomechanics, biomechanical/biomedical engineering, Trefftz elements, hydrated soft tissue, impact biomechanics, head and brain injuries, and cardiovascular fluid-structure interaction. This entry was posted in NL List, The Biz and tagged concussion, concussion protocols, jockey spills, Jockeys, New York Thoroughbred Horsemen's Association, NYTHA by Press Release. Bookmark the permalink.